Ray Charles Robinson (September 23, 1930 - June 10, 2004), known by his shortened stage name Ray Charles, was an American musician. He was a pioneer in the genre of soul music during the 1950s by fusing rhythm and blues, gospel, and blues styles into his early recordings with Atlantic Records. He also helped racially integrate country and pop music during the 1960s with his crossover success on ABC Records, most notably with his Modern Sounds albums. While with ABC, Charles became one of the first African-American musicians to be given artistic control by a mainstream record company.Frank Sinatra called Charles "the only true genius in show business." The influences upon his music were mainly jazz, blues, rhythm and blues and country artists of the day such as Art Tatum, Nat King Cole, Louis Jordan, Charles Brown, Louis Armstrong. His playing reflected influences from country blues and barrelhouse, and stride piano styles. Rolling Stone ranked Charles number ten on their list of "100 Greatest Artists of All Time" in 2004, and number two on their November 2008 list of "100 Greatest Singers of All Time". In honoring Charles, Billy Joel noted: "This may sound like sacrilege, but I think Ray Charles was more important than Elvis Presley. I don't know if Ray was the architect of rock & roll, but he was certainly the first guy to do a lot of things . . . Who the hell ever put so many styles together and made it work?" Ray Charles Robinson was the son of Aretha Robinson, a sharecropper, and Bailey Robinson, a railroad repair man, mechanic and handyman. Aretha Williams was a devout Christian and the family attended the New Shiloh Baptist Church. When Ray was an infant, his family moved from Albany, Georgia, where he was born, to the poor black community on the western side of Greenville, Florida. In his early years, Charles showed a curiosity for mechanical things and he often watched the neighborhood men working on their cars and farm machinery. His musical curiosity was sparked at Mr. Wiley Pit's Red Wing Cafe when Pit played boogie woogie on an old upright piano. Pit would care for George, Ray's brother, so as to take the burden off Williams. However, George drowned in the Williams' bath tub when he was four years old. After witnessing the death of his brother, Ray would feel an overwhelming sense of guilt later on in life. Charles started to lose his sight at the age of five. He went completely blind by the age of seven, apparently due to glaucoma. He attended school at the Florida School for the Deaf and the Blind in St. Augustine from 1937 to 1945, where he developed his musical talent. During this time he performed on WFOY radio in St. Augustine. His father died when he was 10 and his mother died five years after. In school, Charles was taught only classical music, but he wanted to play the jazz and blues he heard on the family radio. While at school, he became the school's premier musician. On Fridays, the South Campus Literary Society held assemblies where Charles would play piano and sing popular songs. On Halloween and Washington's birthday, the Colored Department of the school had socials where Charles would play. It was here he established "RC Robinson and the Shop Boys" and sang his own arrangement of "Jingle Bell Boogie." He spent his first Christmas at the school, but later the staff pitched in so that Charles could return to Greenville, as he did each summer. Henry and Alice Johnson, who owned a store not unlike Mr. Pit's store in Greenville, moved to the French town section of Tallahassee, just west of Greenville; and they, as well as Freddy and Margaret Bryant, took Charles in. He worked the register in the Bryants' store under the direction of Lucille Bryant, their daughter. It's said he loved Tallahassee and often used the drug store delivery boy's motorbike to run up and down hills using the exhaust sound of a friend's bike to guide him. Charles found Tallahassee musically exciting too and sat in with the Florida A&M University student band. He played with the Adderley brothers, Nat and Cannonball, and began playing gigs with Lawyer Smith and his Band in 1943 at the Red Bird Club and Deluxe Clubs in Frenchtown and roadhouse theaters around Tallahassee, as well as the Governor's Ball. After his mother died in 1945, Charles was 15 years old and didn't return to school. He lived in Jacksonville with a couple who were friends of his mother. For over a year, he played the piano for bands at the Ritz Theatre in LaVilla, earning $4 a night. Then he moved to Orlando, and later Tampa, where he played with a southern band called The Florida Playboys. This is where he began his habit of always wearing sunglasses, made by designer Billy Stickles. Charles had always played for other people, but he wanted his own band. He decided to leave Florida for a large city, but Chicago and New York City were too big. After asking a friend to look in a map and note the city in the United States that was farthest from Florida, he moved to Seattle in 1947 (where he first met and befriended, under the tutelage of Robert Blackwell, a 14-year-old Quincy Jones) and soon started recording, first for the Down Beat label as the Maxin Trio with guitarist G.D. McKee and bassist Milton Garrett, achieving his first hit with "Confession Blues" in 1949. The song soared to No. 2 on the R&B charts. He joined Swing Time Records and under his own name ("Ray Charles" to avoid being confused with boxer Sugar Ray Robinson) recorded two more R&B hits, "Baby, Let Me Hold Your Hand" (No. 5) in 1951 and "Kissa Me Baby" (No. 8) in 1952. The following year, Swing Time folded and Ahmet Ertegün signed him to Atlantic Records. Almost immediately after signing with Atlantic, Charles scored his first hit single. "Mess Around" was an R&B hit in 1953. "It Should Have Been Me" and "Don't You Know" both made the charts in 1954, but "I Got a Woman" (composed with band mate Renald Richard) brought him to national prominence. The song reached the top of Billboard's R&B singles chart in 1955 and from there until 1959 he would have a series of R&B successes including "A Fool For You" (No. 1), "This Little Girl of Mine", "Lonely Avenue", "Mary Ann", "Drown in My Own Tears" (No. 1) and the No. 5 hit "The Night Time (Is the Right Time)", which were compiled on his Atlantic releases Hallelujah, I Love Her So, Yes Indeed!, and The Genius Sings the Blues. During this time of transition, he recruited a young girl group from Philadelphia, The Cookies, as his background singing group, recording with them in New York and changing their name to the Raelettes in the process. After his Atlantic Records contract had ended, Ray Charles signed with ABC-Paramount Records in November 1959, obtaining a much more liberal contract than other artists had at the time. Following his commercial and pop crossover breakthrough with the complex hit single "What'd I Say" earlier that year, ABC offered Charles a $ 50,000 annual advance, higher royalties than previously offered and eventual ownership of his masters -- a very valuable and lucrative deal at the time. Composed by Charles himself, the single furthered Charles's mainstream appeal, while becoming a Top 10 pop hit and selling a million copies in the United States, despite the ban placed on the record by some radio stations, in response to the song's sexually-suggestive lyrics. However, by the time of the release of the instrumental jazz LP Genius + Soul = Jazz (1960) for ABC's subsidiary label Impulse!, Charles had virtually given up on writing original material and had begun to follow his eclectic impulses as an interpreter. With his first hit single for ABC-Paramount, Charles received national acclaim and a Grammy Award for the Sid Feller-produced "Georgia on My Mind", originally written by composers Stuart Gorrell and Hoagy Carmichael, released as a single by Charles in 1960. The song served as Charles's first work with Feller, who arranged and conducted the recording. Charles also earned another Grammy for the follow-up "Hit the Road Jack", written by R&B singer Percy Mayfield. By late 1961, Charles had expanded his small road ensemble to a full-scale big band, partly as a response to increasing royalties and touring fees, becoming one of the few black artists to crossover into mainstream pop with such a level of creative control. This success, however, came to a momentary halt in November 1961, as a police search of Charles's hotel room in Indianapolis, Indiana during a concert tour led to the discovery of heroin in his medicine cabinet. The case was eventually dropped, as the search lacked a proper warrant by the police, and Charles soon returned his focus on music and recording. The 1962 album, Modern Sounds in Country and Western Music and its sequel Modern Sounds in Country and Western Music, Vol. 2, helped to bring country into the mainstream of music. His version of the Don Gibson song, I Can't Stop Loving You topped the Pop chart for five weeks and stayed at No. 1 R&B for ten weeks in 1962. It also gave him his only number one record in the UK. In 1962, he founded his own record label, Tangerine Records, which ABC-Paramount promoted and distributed. He also had major pop hits in 1963 with "Busted" (US No. 4) and Take These Chains From My Heart (US No. 8), and a Top 20 hit four years later, in 1967, with "Here We Go Again" (US No. 15) (which would be a duet with Norah Jones in 2004). In 1965, Ray Charles was arrested for possession of heroin, a drug to which he had been addicted for nearly 20 years. It was his third arrest for the offense, but he avoided jail time after kicking the habit in a clinic in Los Angeles. He spent a year on parole in 1966, when his single "Crying Time" reached No. 6 on the charts. During the late 1960s and into the 1970s, Charles's releases were hit-or-miss, with some big hits and critically acclaimed work. His version of "Georgia On My Mind" was proclaimed the state song of Georgia on April 24, 1979, and he performed it on the floor of the state legislature. He also had success with his unique version of "America the Beautiful". In November 1977 he appeared as the host of NBC's Saturday Night Live. In the 1980s a number of other events increased Charles's recognition among young audiences. He made a cameo appearance in the popular 1980 film The Blues Brothers. In 1985, "The Right Time" was featured in the episode "Happy Anniversary" of The Cosby Show on NBC. The next year, he sang America The Beautiful at Wrestlemania 2. In a Pepsi Cola commercial of the early 1990s - composed by Kenny Ascher, Joseph C. Caro, and Helary Jay Lipsitz - Charles popularized the catchphrase "You Got the Right One, Baby!" and he was featured in the recording of "We Are the World" for USA for Africa. After having supported Martin Luther King, Jr. and for the American Civil Rights Movement in the 1960s, Charles courted controversy when he toured South Africa in 1981, during an international boycott of the country because of its apartheid policy. In 1989, Charles recorded a cover version of the Japanese band Southern All Stars' song "Itoshi no Ellie" as "Ellie My Love" for a Suntory TV advertisement, reaching No. 3 on Japan's Oricon chart. Eventually, it sold more than 400,000 copies, and became that year's best-selling single performed by a Western artist for the Japanese music market. Charles also appeared at two Presidential inaugurations in his lifetime. In 1985, he performed for Ronald Reagan's second inauguration, and in 1993 for Bill Clinton's first. In the late 1980s/early 1990s, Charles made appearances on the Super Dave Osbourne TV show, where he performed and appeared in a few vignettes where he was somehow driving a car, often as Super Dave's chauffeur. At the height of his newfound fame in the early nineties, Charles did guest vocals for several projects. He also appeared (with Chaka Khan) on long-time friend Quincy Jones' hit "I'll Be Good to You" in 1990, from Jones's album Back on the Block. Following Jim Henson's death in 1990, Ray Charles appeared in the one-hour CBS tribute, The Muppets Celebrate Jim Henson. He gave a short speech about Henson, stating that he "took a simple song and a piece of felt and turned it into a moment of great power". Charles was referring to the song "It's Not Easy Being Green", which he later performed with the rest of the Muppet cast in a tribute to Henson's legacy. During the sixth season of Designing Women, Charles sang "Georgia on My Mind", instead of the song being rendered instrumentally by other musicians as in the previous five seasons. He also appeared in 4 episodes of the popular TV comedy The Nanny in Seasons 4 & 5 (1997 & 1998) as 'Sammy', in one episode singing "My Yiddish Mamma" to December romance and later fiancee of character Gramma Yetta, played by veteran actress Ann Guilbert. From 2001-2002, Charles appeared in commercials for the New Jersey Lottery to promote its "For every dream, there's a jackpot" campaign. In 2003, Ray Charles headlined the White House Correspondents Dinner in Washington, D.C. where the President, First Lady, Colin Powell and Condoleezza Rice attended. He also presented one of his greatest admirers, Van Morrison, with his award upon being inducted in the Songwriters Hall of Fame and the two sang Morrison's song "Crazy Love". This performance appears on Morrison's 2007 album, The Best of Van Morrison Volume 3. In 2003 Charles performed "Georgia On My Mind" and "America the Beautiful" at a televised annual electronic media journalist banquet held in Washington, D.C. His final public appearance came on April 30, 2004, at the dedication of his music studio as a historic landmark in the city of Los Angeles. Charles was married twice and had 12 children with nine different women. His first marriage to Eileen Williams was brief: July 31, 1951 to 1952. He had three children from his second marriage, to Della Beatrice Howard Robinson from April 5, 1955 to 1977. His long term girlfriend and partner at the time of his death was Norma Pinella. Charles gave 10 of his 12 children checks for one million USD in December 2002 at a family luncheon, while the other two could not make it. On November 14, 1961, Charles was arrested on a narcotics charge in an Indiana hotel room, where he waited to perform. The detectives seized heroin, marijuana, and other items. Charles, then 31, stated that he had been a drug addict since the age of 16. While the case was dismissed because of the manner in which the evidence was obtained, Charles's situation did not improve until a few years later. Individuals such as Quincy Jones and Reverend Henry Griffin felt that those around Charles were responsible for his drug use. By 1964 Charles's drug addiction caught up with him and he was arrested for possession of marijuana and heroin. Following a self-imposed stay at St. Francis Hospital in Lynwood, California, Charles received five years' probation. Charles responded to the saga of his drug use and reform with the songs "I Don't Need No Doctor", "Let's Go Get Stoned", and the release of his first album since having kicked his heroin addiction in 1966, Crying Time. Charles played chess using a special board with holes for the pieces and raised squares. Charles referred to Willie Nelson as "my chess partner" in a 1991 concert. In 2002, he played and lost to American Grandmaster and former U.S. Champion Larry Evans. Charles died on June 10, 2004 at 11:35 a.m. of liver disease at his home in Beverly Hills, California, surrounded by family and friends. He was 73 years old. His body was interred in the Inglewood Park Cemetery. His final album, Genius Loves Company, released two months after his death, consists of duets with various admirers and contemporaries: B.B. King, Van Morrison, Willie Nelson, James Taylor, Gladys Knight, Michael McDonald, Natalie Cole, Elton John, Bonnie Raitt, Diana Krall, Norah Jones, and Johnny Mathis. The album won eight Grammy Awards, including five for Ray Charles for Best Pop Vocal Album, Album of the Year, Record of the Year and Best Pop Collaboration with Vocals for "Here We Go Again" with Norah Jones, and Best Gospel Performance for "Heaven Help Us All" with Gladys Knight; he also received nods for his duets with Elton John and B.B. King. The album included a version of Harold Arlen's "Over the Rainbow", sung as a duet by Charles and Johnny Mathis, which recording was later played at his memorial service. Two more posthumous albums, Genius & Friends (2005) and Ray Sings, Basie Swings (2006), were released. Genius & Friends consisted of duets recorded from 1997 to 2005 with his choice of artists. 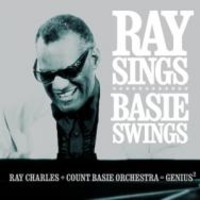 Ray Sings, Basie Swings consists of archived vocals of Ray Charles from live mid-1970s performances added to new instrumental tracks specially recorded by the contemporary Count Basie Orchestra and other musicians. Charles's vocals recorded from the concert mixing board were added to new accompaniments to create a "fantasy concert" recording. Sinatra, and Bing Crosby before him, had been masters of words. Ray Charles is a master of sounds. His records disclose an extraordinary assortment of slurs, glides, turns, shrieks, wails, breaks, shouts, screams and hollers, all wonderfully controlled, disciplined by inspired musicianship, and harnessed to ingenious subtleties of harmony, dynamics and rhythm... It is either the singing of a man whose vocabulary is inadequate to express what is in his heart and mind or of one whose feelings are too intense for satisfactory verbal or conventionally melodic articulation. He can't tell it to you. He can't even sing it to you. He has to cry out to you, or shout to you, in tones eloquent of despair -- or exaltation. The voice alone, with little assistance from the text or the notated music, conveys the message. Ray Charles is usually described as a baritone, and his speaking voice would suggest as much, as would the difficulty he experiences in reaching and sustaining the baritone's high E and F in a popular ballad. But the voice undergoes some sort of transfiguration under stress, and in music of gospel or blues character he can and does sing for measures on end in the high tenor range of A, B flat, B, C and ev in full voice, sometimes in an ecstatic head voice, sometimes in falsetto. In falsetto he continues up to E and F above high C. On one extraordinary record, "I'm Going Down to the River' . . . he hits an incredible B flat . . . giving him an overall range, including the falsetto extension, of at least three octaves. In 1979, Charles was one of the first of the Georgia State Music Hall of Fame to be recognized as a musician born in the state. Ray's version of "Georgia On My Mind" was made the official state song for Georgia. In 1981, he was given a star on the Hollywood Walk of Fame and was one of the first inductees to the Rock & Roll Hall of Fame at its inaugural ceremony in 1986. He received the Kennedy Center Honors in 1986. In 1987, he was awarded the Grammy Lifetime Achievement Award. In 1991, he was inducted to the Rhythm & Blues Foundation. In 1993, he was awarded the National Medal of Arts. In 1998 he was awarded the Polar Music Prize together with Ravi Shankar in Stockholm, Sweden. In 2004 he was inducted to the Jazz Hall of Fame, and inducted to the National Black Sports & Entertainment Hall of Fame. The Grammy Awards of 2005 were dedicated to Charles. On December 7, 2007, Ray Charles Plaza was opened in Albany, Georgia, with a revolving, lighted bronze sculpture of Charles seated at a piano. Later that month, on December 26, 2007, Ray Charles was inducted into the Hit Parade Hall of Fame. He was also presented with the George and Ira Gershwin Award for Lifetime Musical Achievement, during the 1991 UCLA Spring Sing. In 2003, Charles was awarded an honorary degree by Dillard University. Upon his death, he endowed a professorship of African-American culinary history at the school, which is the first such chair in the nation. A $20 million performing arts center at Morehouse College was named after Charles and was dedicated in September 2010. The biopic Ray, released in October 2004, portrays his life and career between 1930 and 1969 and stars Jamie Foxx as Charles. Foxx won the 2005 Academy Award for Best Actor for the role.